Michael York and Jenny Agutter star in this highly enjoyable and sucessful adaption of the classic novel. ITV R2 DVD release. Co-scripted by director Tony Maylam, a number of changes are made to Erskine Childers novel - the majority of these are clearly required to fit the densely plotted novel into a feature-film run-time, although some scenes are also added to provide a few 'action' moments. 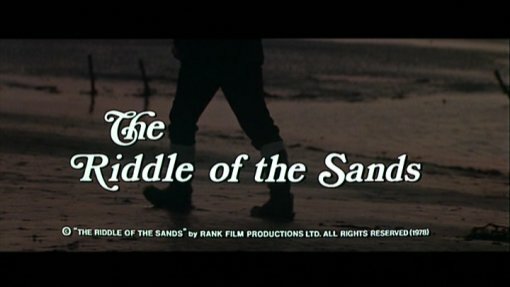 Fortunately the script manages the most important task of any book to film conversion and retains the atmosphere and tone of the novel throughout, with unerring loyalty to the names of places and characters and even the invented action scenes are presented in the classic boy's-own adventure style of Childers' text and merge seamlessly. The cutting down of the script is not completely seamless and there are some points that will be a little unclear, particularly to those who do not know the book - this is most notable towards the start when the narrative suddenly jumps unannounced by several days, leading to what appears to be a rather jarring continuity problem. On its own, the screenplay provides a superbly entertaining classic adventure storyline, building effective characterisation, a good degree of mystery and a number of tense action scenes, while uninterupted by unnecessary romance or comic-relief. Pacing is generally strong, although a couple of scenes do seem like they would have gained from an extra few minutes run-time. The climax is suitably dramatic and will certainly be a surprise even to fans of the novel, although again the script here retains the feel of the original work. Maylam's direction is strong, capturing well the sailing environment with some beautiful shots of the boats at sea and most importantly not a frame of the optical effects that ruin many adventure films. The period feel is well represented with some beautiful looking scenes in the towns and on board a train. Howard Blake provides a very fitting score that is well edited into the film, perfectly exemplified in the opening sequences with a panning shot from the menacing Herr Dollman to his delectable daughter, with the music changing from a suitably dramatic score to a light theme. Michael York is perfectly cast in the leading role, his upper class appearance and very slight figure work well to emphasise how out-of-place the character is in the opening scenes. Simon MacCorkindale (best known for his work on British television series Casualty is similarly well cast as Davies and is convincing as a man who has been at sea for a long time. Jenny Agutter gets a smaller but significant part as Clara and gives another fine peformance as do the rest of the cast. For fans of the book there is much to enjoy here and while purists will no doubt baulk at the changes made, they are essential to keep the film to a plausible length and the overall atmosphere of Childers' work is well captured. For newcomers to the story, this is certainly a film that fans of classic adventure stories will enjoy and although made in the 1970s, it could easily be a product of the 1930s. Michael York fans will certainly want to seek this out for another strong performance. It comes generally recommended. Directed by anyone interesting? Tony Maylam - a London born director whose few other credits include the gory camp slasher movie The Burning (1981) and British action film Split Second (1992) starring Rutger Hauer. Any gore or violence? None. Who is it for? Fans of the book, of classic adventure movies and of Michael York will certainly enjoy this. Visuals Original Aspect Ratio - 2.35:1 non-anamorphic widescreen. Colour. Picture quality is generally strong, with good colours and minimal print damage. Although non-anamorphic, the picture stands zooming quite well, although the fog scene shows some noticable artifacting. Note: this disc incorrectly lists the image as being fullscreen 4:3 on the back of the DVD case. Audio English mono - sounds fine throughout, with the music coming through well. (English subtitles are included on the print for a few scenes in German). Other regions? Not otherwise available on DVD. A wonderful adventure film that harks back to an earlier era of cinema and is a great tribute to the book. Recommended. A good looking DVD release despite being non-anamorphic. The complete lack of extras is a disappointment. All text in this review written by Timothy Young - 21st December 2007/21st July 2010.